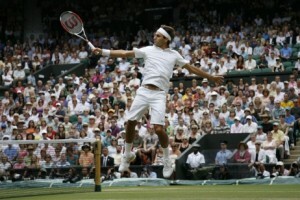 Sports Then and Now | Roger Federer: How Does He Stack Up Against the 10 Greatest of All Time? Roger Federer: How Does He Stack Up Against the 10 Greatest of All Time? 10. Mats Wilander – 7 Grand Slam Singles titles, 33 Singles Titles, 20 Weeks at No. 1. Sweden's Mats Wildander ranked World No. 1 in 1988. Mats Wilander never won Wimbledon even though he managed to win the Australian Open when it was still played on grass. His baseline game was a severe test to overcome. Contemporary serve and volleyers playing against Wilander thought that three shots comprised a long rally. The Swede, however, won his points slowly, wearing his opponents down with his fitness and his determination to win. 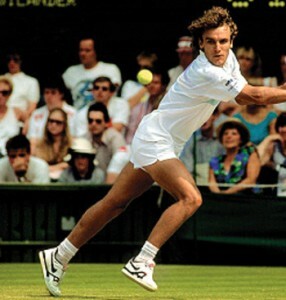 In 1988, Wilander accomplished winning three out of four majors along with securing the No. 1 ranking at long last. (3) 7 Grand Slam singles titles out of 11 finals, 63.6 percent. No wins at Wimbledon. (4) l Grand Slam doubles title. (6) 0 Olympic Gold Medals. (7) 0 ATP Masters Shields. (10) 571 career singles matches while losing 222 for an overall FedEx Index of .720. (11) 144 career singles grand slam matches while losing 37 for an overall FedEx index of .796. 9. Jimmy Connors – 8 Grand Slam Singles Titles, 107 Singles Titles, 268 weeks at No. 1. American Jimmy Connors enjoyed a long and successful career in tennis. 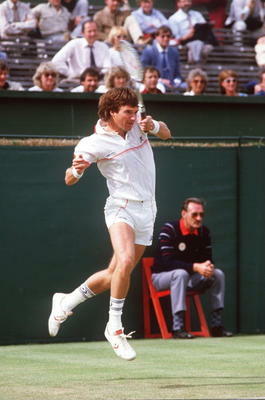 Jimmy Connors won most of his matches with attitude. He simply refused to lose unless his opponent was more insistent than Connors. This did not happen often. Connors seemed more like a prize-fighter than a tennis player. He only knew one gear. Third or all out attack. Connors let you know right out of the gate that he was not going to give away anything. If he lacked finesse in his game, he did not care. His total aggression was usually enough to get the job done. (2) 8 Grand Slam singles titles out of 15 finals, 53.3 percent. No French Open wins. (3) 2 Grand Slam doubles titles out of 3 finals, 66.7 percent. (4) 1 ATP Year-End Tour Championship in singles. (5) 0 Olympic Gold Medals. (6) 0 ATP Masters Shields. (10) 232 career singles grand slam matches while losing 49 for an overall FedEx index of .826. 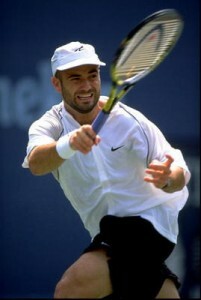 Amercian Andre Agassi played professional tennis to the age of 35. You could really say that Andre Agassi lived through two tennis careers. He burst onto the scene as the superstars of the 1980s were beginning to fade, bringing a new brand of attitude onto the court. Early on Agassi was expected to dominate the men’s game, but, he got upstaged by Sampras and other Americans. He could have retired with a decent record. Feeling he had not done his best, Agassi reinvented himself as a serious athlete, whose determination was second only to his determination. (2) 1 doubles titles out of 4 finals, 25.0 percent. (3) 8 Grand Slam singles titles out of 15 finals on all surfaces and at all venues––53.3 percent. (5) 1 Olympic Gold Medal in Men’s Singles. (6) 16 ATP Masters Shields. (9) 870 career singles matches while losing 274 for an overall FedEx Index of .760. (10) 224 career singles grand slam matches while losing 53 for an overall FedEx index of .809. (11) 209 career singles Masters Series 1000 matches while losing 73 for a FedEx index of .741. 7. 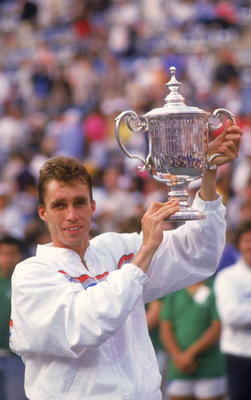 Ivan Lendl – 8 Grand Slam Singles titles, 94 Singles titles, 270 weeks at No. 1. Czech Ivan Lendl ruled tennis in the mid to late 1980s. Ivan Lendl inhabits the role of the overlooked man of modern tennis. Yet Lendl dominated men’s tennis in the 1980s and greatly annoyed his competitors, which was pretty easy to do in the 1980s. Although Lendl never won Wimbledon, he won just about everything else. Without an abundance of natural athletic talent, Lendl became a superb tactician, and an even more superbly fit athlete. Lendl had the ability to map out his matches like maneuvering rooks and pawns. His ground strokes were lethal and robot-like. But it was his mental acumen that made him great. (3) 8 Grand Slam singles titles out of 19 finals, 42.1 percent. No wins at Wimbledon. (10) 222 career singles grand slam matches while losing 49 for an overall FedEx index of .819. 6. John McEnroe – 7 Grand Slam Singles titles, 77 Singles titles, 170 weeks at No. 1. John McEnroe played serve and volley tennis like no other man before him. 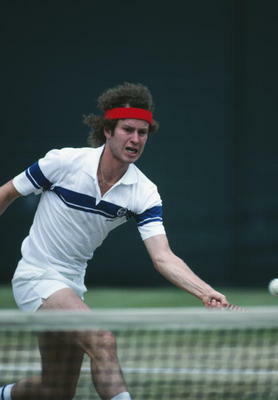 Another product of the 1980s, John McEnroe drove a wedge in the fan base. The traditionalists detested him and the young relished his brat-like behavior on court. When it came right down to it, you either loved McEnroe or you hated him. One thing for sure, there was no ignoring him. McEnroe brought another whole dimension to modern tennis and changed the face of the game. He hated to lose and did not hesitate to show the world what that felt like. In this ranking, you have to credit McEnroe for not only his magnificence in singles, but also in his total dominance in doubles throughout his career. (3) 7 Grand Slam singles titles out of 11 finals, 63.6 percent. No French Open wins. (4) 9 Grand Slam doubles titles. (5) 1 Grand Slam mixed doubles title. (8) 10 ATP Masters Shields–3 in singles, 7 in doubles. (9) 170 weeks at No. 1 in singles. (10) 257 weeks at No. 1 in doubles. (12) 875 career singles matches while losing 198 for an overall FedEx Index of .815. (13) 167 career singles grand slam matches while losing 38 for an overall FedEx index of .815. (14) 13 career singles Masters Series 1000 matches while losing 11 for a FedEx index of .542. 5. Rafael Nadal –9 Grand Slam Singles Titles, 43 Singles Titles, 93 Weeks at No. 1. Current World No. 1 Rafael Nadal rules tennis today. Rafael Nadal, as an active player, is still adding to his totals. Currently Nadal holds the No. 1 ranking, showing no signs of relenting his hold on the top rung.His career is still on the rise at age 24. 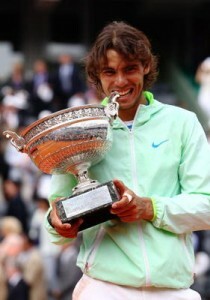 If he wins the 2011 French Open, he will be in double digits in total slam wins. Most think he will equal or pass Federer’s accomplishment in this statistic. Known primarily as a clay-court specialist early in his career, Nadal has now won majors on all surfaces and in all settings. Just how far he will rise is yet to be seen. (6) 18 ATP Masters Shields. (10) 124 career singles grand slam matches while losing 18 for an overall FedEx index of .873. (11) 196 career singles Masters Series 1000 matches while losing 40 for a FedEx index of .831. Swede Bjorn Borg retired from tennis at age 26. 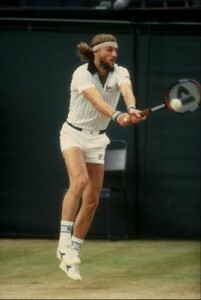 Bjorn Borg of Sweden was the first rock-star tennis player. His long blond hair and his phenomenal good looks brought a whole new audience to the sport. But he was more than just a handsome face. Borg’s refusal to be defeated made him a remarkable champion on grass and clay. 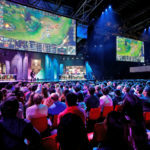 His great rivalry with Americans McEnroe and Connors drew much attention to the sport as television became part of its sell. Borg left the game at age 26––far too soon in the estimation of many. But while he has there, his star shone bright. (3) 11 Grand Slam singles titles out of 16 finals, 68.75 percent. No slam wins on hard courts. (10) 141 career singles grand slam matches while losing 16 for an overall FedEx index of .898. 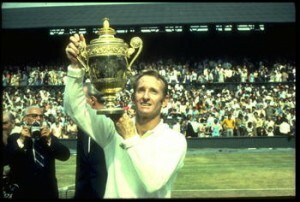 Australian Rod Laver won 2 calendar year grand slams. Rod Laver had his feet in two different tennis worlds–(1) Pre-Open Era and (2) Open Era. It divides his life’s work. Much of Laver’s tennis career was spent as a tennis professional. This barred the Aussie and many of his contemporaries from competing in the grand slam events. Yet, even with that restriction, Laver stands out as one of the top three ever to play the sport. Laver was the World No. 1 player for seven consecutive years. He is also the only player in history to have twice won all four Grand Slam titles in the same year. No other player of the modern (open) era has managed it once. (9) (ATP) Won 412 career singles matches while losing 106 for an overall FedEx Index of .795. (9) (ATP) Won 60 career singles grand slam matches while losing 10 for an overall FedEx index.857. 2. Pete Sampras – 14 Grand Slam singles titles, 64 Singles titles, 286 weeks at No. 1. American Pete Sampras holds the record for the most weeks at No. 1 - 286 weeks. American Pete Sampras won his first and last Grand Slam trophies at the U.S. Open. 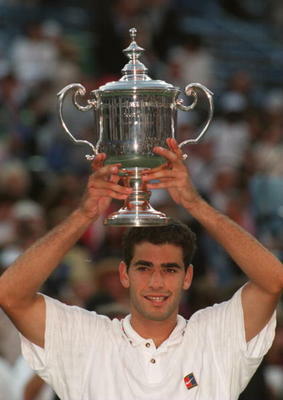 The first Sampras captured in 1990 was as a teenager. The second Pistol Pete won in Flushing Meadows in 2002 at age 29. In between Sampras practically owned Wimbledon, winning seven championships there in eight years. Sampras held the No. 1 ranking at the year end for six consecutive years from 1993-1998. By one week, Sampras owns the record for holding the No. 1 ranking the longest at 286 total weeks. For all of Sampras’ power and athleticism, he could never win on the red clay of Paris. The French Open eluded him for 13 years. (3) 14 Grand Slam singles titles out of 18 finals, 77.8 percent. No French Open wins. (6) 11 ATP Masters Shields. (10) 203 career singles grand slam matches while losing 38 for an overall FedEx index of .842. (11) 190 career singles Masters Series 1000 matches while losing 70 for a FedEx index of .731. 1. Roger Federer – 16 Grand Slam Singles titles, 67 Singles titles, 285 weeks at No. 1. Roger Federer has won 16 grand slam titles since his first in 2003 at Wimbledon. Roger Federer is still playing tennis, ranked currently No. 3 in the world behind Rafael Nadal and Novak Djokovic. Federer became the natural successor to Pete Sampras, being probably the most complete tennis player of all time. He has no weaknesses in his game, and his story is still being written. No one has dominated men’s tennis as long or as completely as Roger Federer who held the No. 1 ranking for 237 consecutive weeks from 2004-2008. He won both Wimbledon (2003-2007) and the U.S. Open (2004-2008) five consecutive years. He has won 16 grand slam singles titles, the most of any male in the history of the sport and many feel he has more to come. (6) 17 ATP Masters Shields. (10) 213 career singles grand slam matches while losing 31 for an overall FedEx index of .873.